If the city can figure out a way to pay a ~$22,000 matching fee a van similar to this one could begin serving Collinville's public. MONDAY, APRIL 6, 2009 AT 7:00 P.M.
A. Approval of Claims in the amount of $11,429.37. C. Approval of Minutes of the March 12, 2009 Special Meeting, March 16, 2009 Regular Meeting and April 2, 2009 Special Meeting. D. Supplemental Appropriation in the amount of $894.44 reimbursement for January 2009 Seat Belt Grant. E. Supplemental Appropriation in the amount of $16,438.44 reimbursement for August 22-November 21, 2008 Firefighter Safer Grant. F. Supplemental Appropriation in the amount of $2,936.25 reimbursement for Police Department in Car Camera Grant. G. Supplemental Appropriation in the amount of $16,251.84 reimbursement for November 22, 2008 to February 24, 2009 Firefighter Safer Grant. H. Supplemental Appropriation in the amount of $606.00 for EMS Rural Memberships. I. Supplemental Appropriation in the amount of $450.00 for Jail Fee. J. Supplemental Appropriation in the amount of $165.50 reimbursement for Sign Property Damage. 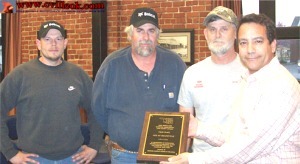 K. Supplemental Appropriation in the amount of $975.91 reimbursement for February 2009 Seat Belt Grant. 6. Presentation by Debra McGlasson and Eric Harris regarding Pelivan Transit. -- McGlasson outlined a 1-van system for Collinsville in partnership with Owasso's 2-van system and dispatching for public transit in the range of $1.50 to $3.50 per 1-way trip. Collinsville residents can already use Owasso's vans but would pay $1.50 per mile. (see Pelivan photo at top of page). 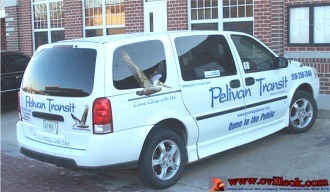 The Pelivan system serves several rural communities in NE Oklahoma. The city would need to contribute $22K to fully participate in the system. 7. Discussion, consideration and possible action on Vision 2025 Budget and Downtown Neighbor Projects. -- approved, the lastest update to the budget reflects the completion of the streetscape project and shows ~$13K remaining for park improvements. * Potential federal stimulus grants are being explored by each city department. (And as was much discussed on several topics above ... the rules for this stimulus money change daily as it is an evolving process). The city will attend a meeting in Owasso this week for more info. * City offices will be closed Friday (Good Friday). POSTED BY: Angela Long-- DATE: 4/3/09 -- TIME: 4:00 p.m.
A. Approval of Claims in the amount of $185,058.02. B. Approval of March # 1 Payroll in the amount of $21,279.95. C. Approval of Minutes of the March 16, 2009 Regular Meeting.